For the high quality repairs on thinner metals, why look anywhere other than the Longevity Migweld 140 MIG welder. This small, light, portable welder though surprisingly powerful, (it can weld up to 3/8 inch of mild steel, stainless steel or aluminium), is surprisingly neat and accurate with metals around 1/8 inch thick. Included with the welder are a MIG Gun, .030 spool of wire, a ground clamp and various tips. 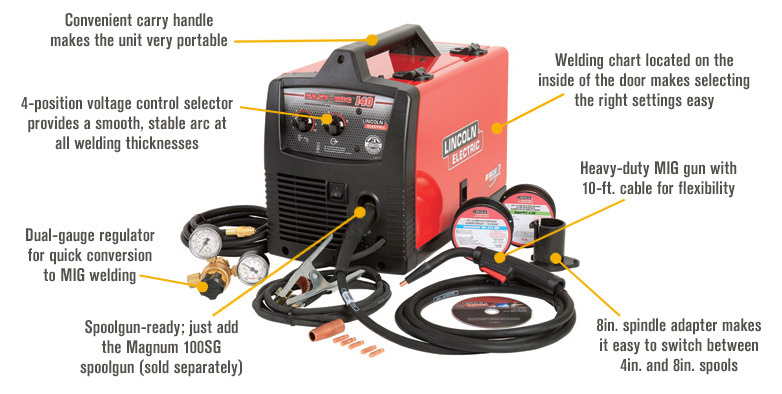 The Longevity Migweld 140 MIG welder runs on standard 110v outlet power. It is easy to use, and has been highly recommended to both amateurs and professionals alike. The controls are clear and concise, and because of this, the welder is very easy to learn how to use and operate. This means it is becoming popular with hobbyists and repair welders. 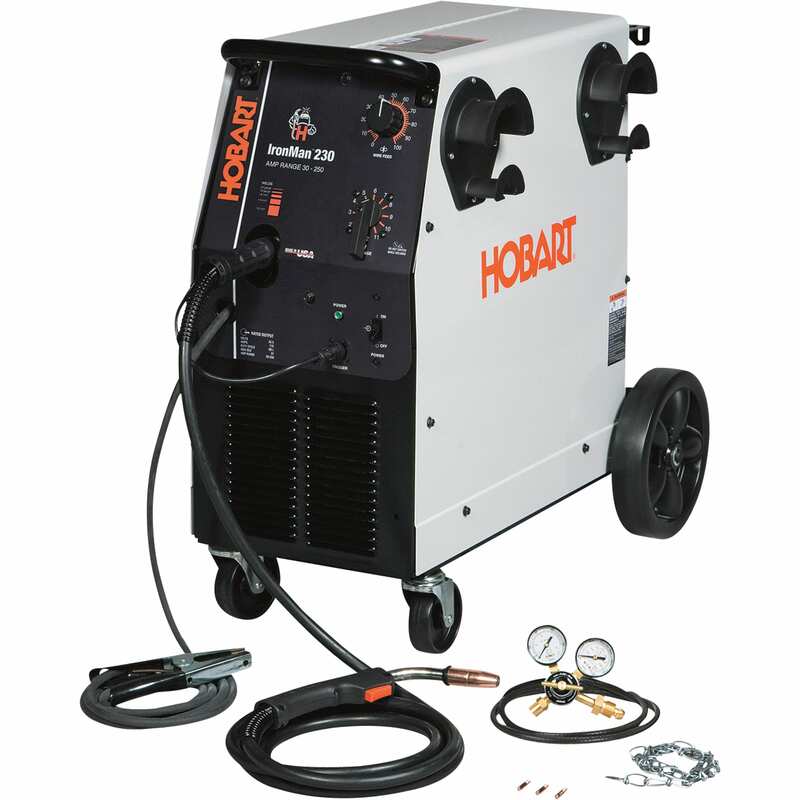 With the Longevity Migweld 140 MIG welder being so modest in the cost department, you would expect a sub-standard or uncompetitive piece of machinery. However, the people who have invested in one soon realise the value of this machine and just how useful it truly is. It is very good for amateurs and hobbyists. You do get wire to start off your welding, you are supplied with only solid wire, and have to purchase flux cored wire separately. The wire feed mechanism leaves a lot to be desired, and breaks easily or becomes prone to slipping after just a few welding sessions. The ground clamp is weak and slippery, making welding tricky sometimes. It takes several passes to weld 3/8 inch mild steel contrary to the manufacturer’s report. 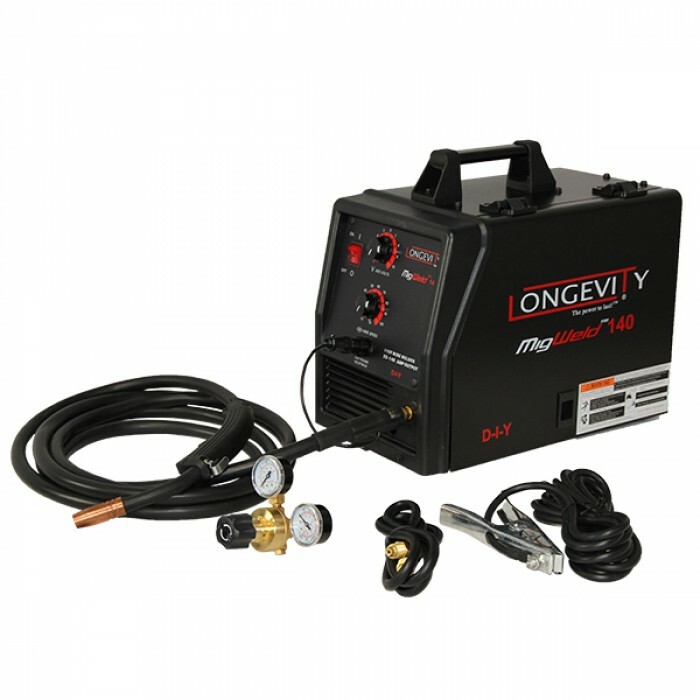 First of all, the Longevity Migweld 140 MIG welder is well priced compared to the competition. The fact that the controls are so understandable is a definite plus. With the additional spool gun, the welder gets even better, and you can weld with even more precision. Secondly the Longevity Migweld 140 MIG welder will run on .025 to .035 diameter wire, allowing for a host of different tastes and preferences. The .035 tip is the best for welding metals 1/6 inch to ¼ inch thick, and when compared to the more expensive competing brands, the performance and quality of work the machine is capable of becomes evident. 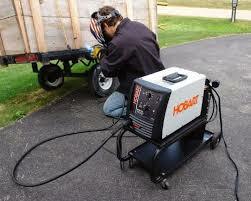 Lastly the light weight of the Longevity Migweld 140 MIG welder must also be noted. At just under 60 lbs, this particular welder is extremely portable and easy to transport, making it ideal for repair jobs and work in the field. The first and probably largest problem with the Longevity Migweld 140 MIG welder is the wire feed system. This particular feeding system is so unreliable there are reports of it falling apart after as little as an hour of welding work. Though this problem is easily fixable, it is something that the manufacturer should address as it seems to happen very frequently with this welder model. The next problem is though the manufacturer claims that the machine will weld 3/8 inch metal, it takes several passes to complete such a join. When it is finally complete, it does not look as nice as it could be. Also, if you are going to use the welder outdoors, ensure that the welder is out of direct sunlight. The heat of the sun tends to wrinkle and warp the face of the machine. Though most users had praise for the Longevity Migweld 140 MIG welder (once the wire feeder was fixed) it seemed their feelings were the total opposite for Longevity itself. Many saying that customer service was not up to par and that it took too long (up to 8 weeks) for warranty claims to be sorted. The Longevity Migweld 140 MIG welder is a very good machine indeed, yes it has its little glitches, but once those are sorted out, you can get some quality work done.